Sorry that I haven't posted in some time! Uni is finished now, and I'm all moved into a new flat in Saint Albans. I have been exploring around the neighborhood lots. It is a very interesting and inspiring area! I've collected many ideas for some short stories I'm working on which is good. I have applied for the craft fair at the end of the year, so here's hoping I make the cut! If so, shall be bringing my Creative Design business in on it too, hopefully with some posters, stickers, letter sets and maybe even a calendar! But I'll let you know more about that if I am accepted! I am meant to be doing Nanowrimo at the moment, but of course, I'm letting myself get distracted! so if you are a boy, you might not care to read any further! Ha ha! For the last six months I have been medicine free! I was previously on various medicines for over two years, since starting on them I gained over 20kgs. All sorts of people, some professional, some just friends, tried telling me their opinion in relation to the weight gain, but at the end of the day, I knew it was the medicine's fault, as after stopping it, I haven't gained anymore. I spent many hours trawling through messages from other people who've had the same problem, so I wasn't alone! I have never really been one to eat heaps of junk food or take-aways, I love veggies and healthy foods. As well as fresh baking! Om nom nom. Only I think I must of been having too much of even the healthy stuff and suffice to say, I have now joined up to Weight Watchers Pro Points online. It is awesome, and easy to use. You can even download this little app for your smart phone so you can track on the go! I highly recommend it to anyone who wants to lose a little, or even maintain a certain weight. It costs a little bit to sign up, but I don't regret it one bit! It's such an investment, why it's the cost of your health at stake! I really enjoy finding out what foods are better than others and I like how it makes me stop to think before eating just any old thing. I think it's not something to be embarrassed about, because it's making healthy people, and I think that's a good thing. You've gotta remember there are two kinds of people, firstly people whose fatty tissue stores on the outside, and the other whose stores on the inside - skinner doesn't always mean healthier, the former luckily has a visual warning. So I'm going to be putting up my own recipes for foods that fill you up, are high in nutrients and low in points!!! Better living everybody! (LOL) To find out more about the Pro Points system click here! Cut the tomatoes into thick slices and place on a lunch plate. Slice cheese and place on top of tomatoes. Finish by placing a basil leaf on top of each. I have been wanting a drink to replace the copious amounts of juice I drink. Normally I would drink soda water with lemon, which is nice. 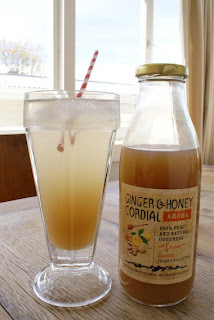 AROHA Ginger and Honey Cordial. I mixed it with soda water. It was yum, quite spicy.